Live foods are vital to the good health and nutrition of aquarium fish. They are what fish eat in nature, and a necessity for successful breeding and raising the fry. Here below are the live food cultures I currently offer for sale, and instructions for culturing and using these and other live foods. 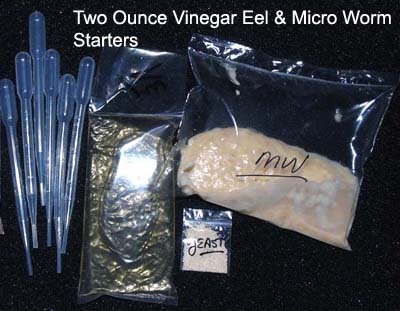 Micro MW, Banana BW, Walter WW Worm cultures, and Vinegar Eels VE are always available. Clean grindal and white worm cultures, and daphnia, will be available here in spring 2019. Check back for them, as they go really fast when available. These four nematode worms are indispensible as first or second foods for thefry of almost all freshwater aquarium fish. They are simple to culture and maintain and all but the vinegar eels get started very quickly. The MW, BW and WW are all cultured on solid medium like oatmeal, and the VE are cultured in a jug of cider vinegar and water. They differ mainly in terms of size, reproductive rate, and how long they stay alive in water. The differences are not visually apparent at the level of individual worms. They become apparent at the level of a whole culture. You should always plan ahead and have cultures going before fry arrive, especially with vinegar eels that usually take four to six weeks to get going. Once a VE culture does start producing though, it can last up to a year! 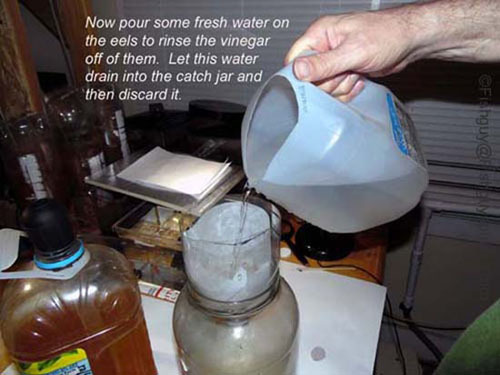 With little to no maintenance required, it is a good idea to just start and keep a jug or two of vinegar eels running just in case. All four have about the same high nutritional value, a close second in many respects to newly hatched baby brine shrimp (BBS). The comparison table here below summarizes the important differences. If you are hatching really tiny fry like bettas, you want walter worms and vinegar eels. You can start larger fry that are still too small for BBS right away on banana worms or micro worms. Micro worms are also good for fry growing out and even smaller fish like neons, juvenile guppies, or badis. Micro Worm - Banana Worm - Walter Worm - Vinegar Eel Cultures For Sale. Two, Six and Ten Ounce Cultures Available. These low cost starters are available for all four nematodes: micro worms, banana worms, walter worms and vinegar eels. 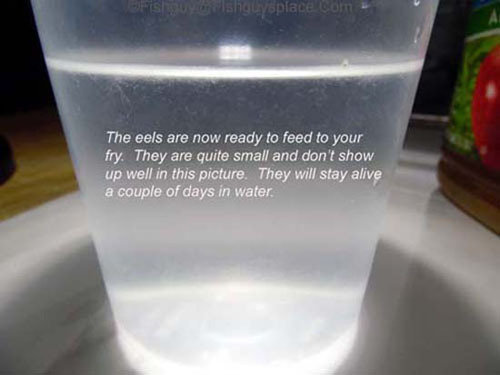 The vinegar eels take four to six weeks to get going well, and the micro, banana and walter worms at least one week in a sandwich-size container. Shipping costs are combined for cost savings on multiple item purchases. 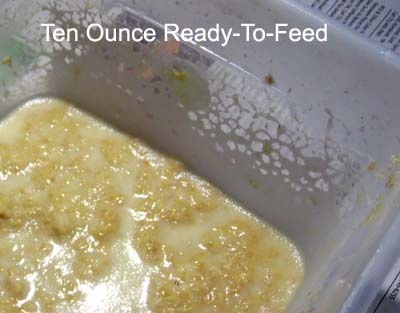 This is a larger culture used to start multiple mother cultures OR as shown below, be used out of the bag as a medium Ready To Feed (RTF) culture so you will not have to wait a week to feed those hungry fry. The image to the right was taken 30 minutes after a quick start culture was placed in the container. The worms are already climbing the sides and ready to feed with the swipe of a finger. While you are feeding from these mature cultures, you can take a couple spoon-fulls and start a new mother culture going per the very complete instructions you get when you purchase your culture. This culture has simply been poured into an empty container. For even more versatility you can pour it over a quarter to half inch of cooked oatmeal and start a culture while feeding from it! This culture is over a half pound of mature mother culture ready to feed as many fry as you have. You can feed from these very shortly after set-up, and there is plenty to start a backup or two as well. The culture comes in two, 5 ounce bags that are the working upper portion of one of my shoe-box mothers transported to your fish room. Begin by preparing a container for your culture. 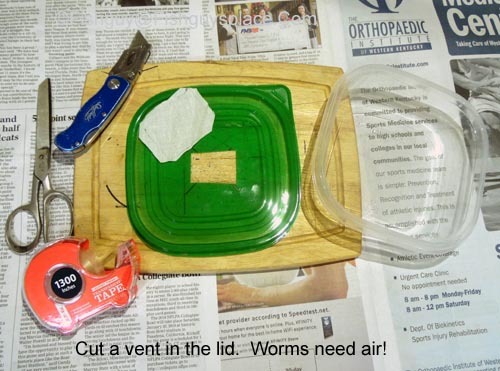 Here I use a sandwich size plastic container and cut a rectangular vent in the lid, covering it with thin muslin cloth to keep pests out. The cloth square is taped in place along its edges. 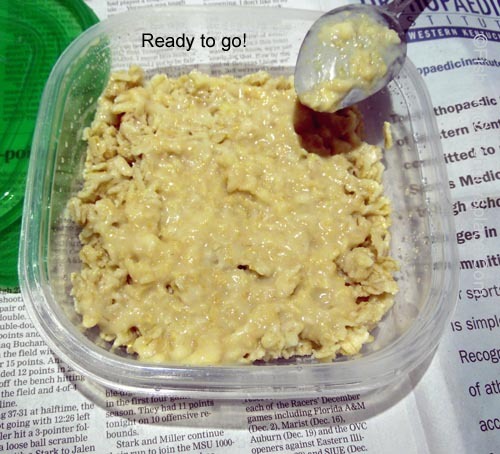 Once the container is ready, put about 1/2" to 3/4" of cooked, COOLED, oats in it. They should be shiny-wet but not soupy. Oats that are too dry will mold. I prefer the Old Fashioned oats that cook for five minutes because they hold up longer than the instant. Some use mashed potatoes or even a slice of bread. Many sources of carbohydrate will work. 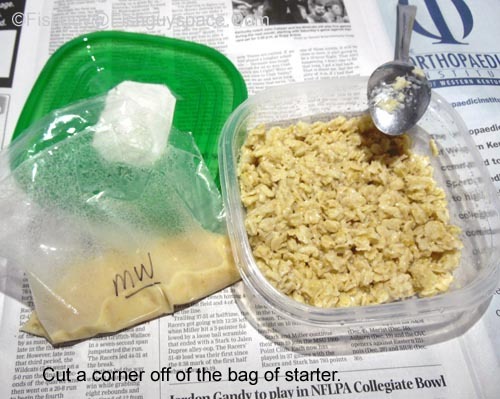 NOTE: These instructions are based on using a two ounce starter. 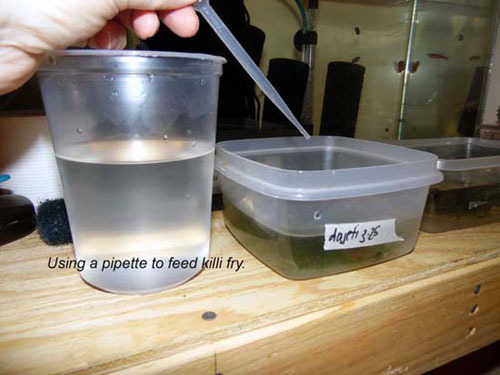 If you have a larger amount of starter or a Ready To Feed (RTF) culture, then use a larger container. 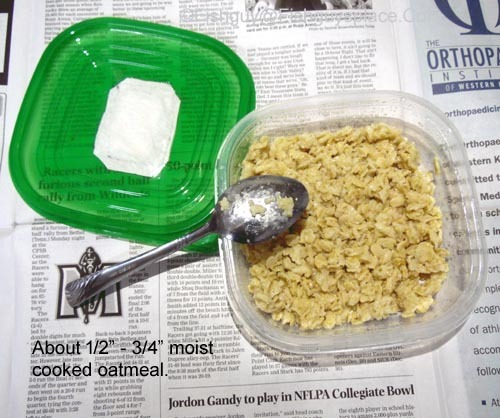 Size it so a 1/2" of oats topped with your starter brings you to less than an inch total depth. You always want more surface area and not too much depth. If you got your starter from me it will be sealed into a plastic bag. This happens to be micro worms. The easiest way to get the starter into your container is to snip off one corner and then pipe it out like cake frosting. Starter placed on medium. I always ship a little extra so no worries about the small amount left in the bag, just toss it. Your culture is ready to close up and put on a shelf somewhere out of direct sunlight. A cool place in the room temperature range works well. They will be fine in any temperature you are comfortable in. They toleratecold better than heat, and a culture will cycle faster in higher temps, shortening it's useful life. 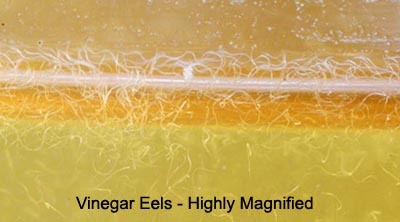 Vinegar eels are by far the easiest live food to culture. I've got jugs that have been working for more than a year. 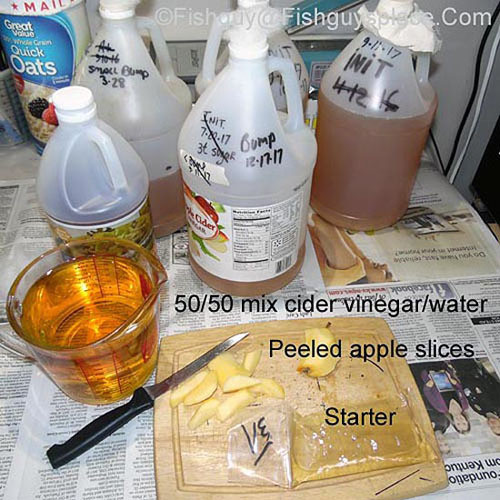 To start a culture, rinse out a gallon jug and fill it to where it begins to narrow with a 50/50 mix of cider vinegar and dechlor water. Then add four or five slices of peeled apple. The skin can contain pesticides. Finish by adding the starter and plugging the jug with fliter floss or rubber-banding a thin cloth in place to keep out flies and allow air in. Date the jug and put it in a cool dark place at room temp and that's it. Agitate it once a week or so with a $store baster and you'll be ready to feed from it in 4-6 weeks. I advise starting a second jug about three weeks in using a few ounces from your first jug as a starter. A month or so later.........To see if your culture is ready to use, pull some up in a baster and check with a magnifier or just viewing with a light source behind the baster. When you see lots of vineger eels it is ready. I harvest with a coffee filter put in a funnel made from the cut off top of a two liter soda bottle. You can also get a funnel at the $store. Put a few ounces of your culture into the filter and let it drain completely. The funnel sits in a clean catch jar. 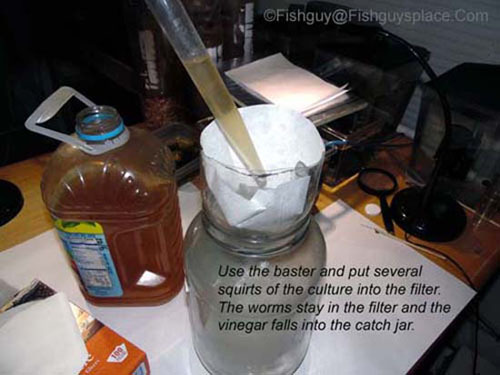 Here the vinegar has drained into the catch-jar and the vinegar eels are in the filter paper. 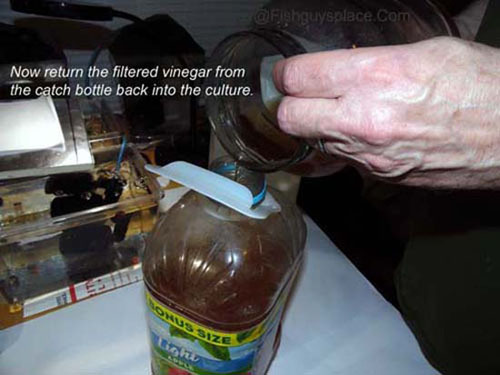 Return the filtered vinegar to the culture jar. If the culture is older and is starting to lose its sharp vinegar smell, then just discard this filtered vinegar and add fresh vinegar water mix to the culture. 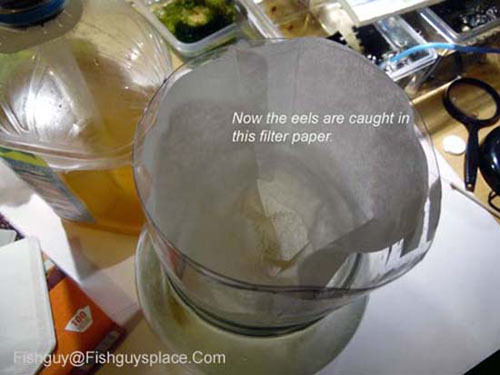 Use fresh water to rinse the vinegar off of the vinegar eels in the filter paper. Toss the rinse water afterwards. 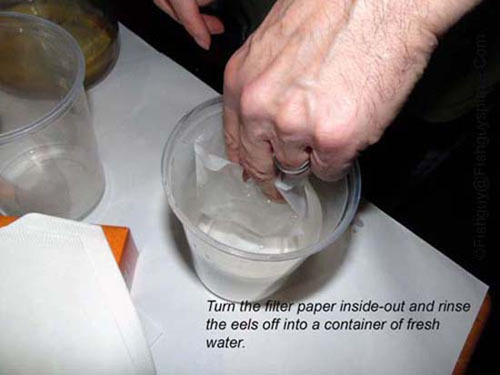 Collect the vinegar eels by turning the filter paper inside out and swishing it thoroughly in a container of fresh dechlor or tank water. Vinegar eels harvested and ready to feed to fry. Feed the fry! A very small live food that swims and triggers the strike response of very tiny fry, and stays alive and doesn't foul the tank. Are MW, BW and WW all cultured the same way? What kind of worms are MW, BW and WW? They are nematode worms, also known as roundworms. There are about 25,000 species identified so far out of a total of perhaps 1,000,000. What are the differences between these three worms? Nematodes are difficult to identify even for experts. The differences between these three are best seen at the level of whole cultures and with experience. MW are the largest, reproduce slowest and don't stay alive quite as long as the others in water. BW and WW are smaller, reproduce faster, and last a bit longer in water. Some say the WW stays up in the water column longer, but I have not verified that. For smallest fry I use WW. For larger fry and small fish I use MW. The worm 'in the middle' in most respects is the BW. They reproduce sexually and drop living young. Using the microworm as an example, they release 10 to 40 young every 1 to 1.5 days for a 20 to 25 day life span. Therefore, each female produces approximately 300 young. The young reach sexual maturity in approximately three days. Their size increases by three times during the first day and five to six times during the next three days. The live nematodes are 76% water and 24% dry matter; 40% of the dry matter is protein and 20% is fat. What do these worms eat? They do not eat the medium! Free living nematodes like these are bacterivores, meaning that they eat very small organisms like bacteria and yeast cells. So why the oatmeal? The oatmeal, or any other carbohydrate that you use, is broken down by living yeast cells and bacteria that in turn are eaten by the worms. It is a miniature ecosystem wherein yeast 'eats' the carbs in the oats, then the worms eat the yeast. What should I feed my culture and how often? A heathy culture doesn't need to be fed after it is started. As per my instructions above, you can add a pinch of yeast to help seed your culture when you set it up. After that, the yeast lives and multiplies in the culture and no more needs to be added. It is the action of the yeast that breaks down the medium, oats in this case. Adding a lot of yeast may 'put the pedal down' on a culture and accelerate its growth, but that also shortens its useful life. A pinch at startup works fine, and perhaps another if it is not growing, but always take it easy with yeast. How wet should my culture be? At startup it should be shiny-wet, but not soupy and runny. Cultures that are too dry to start with will end up molding, but you'll never see mold in a healthy culture because the worms can easily get to it and consume it before it grows out. If you see mold, skim it off and stir in some water. As a culture ages it will naturally get wetter and runnier because enzymes from the yeast are breaking down (fermenting) the carbs in the medium. What temperature should the cultures be kept at? Any temperature you are comfortable in works for these cultures. They are more tolerant of cold than heat, and are good down to just before freezing solid. When cold, they just slow down and will go dormant til warmed back up. Temps above 90 (F) are dangerous for them. As temps go up, cultures reproduce faster and age quicker. Cooler, and they take longer to mature and therefore last longer. Heat=Faster / Cold=Slower. When should I start a second culture? I advise always having a backup culture going in case your older culture crashes suddenly. It is a good idea to start your backup as soon as your mother culture gets going strong. Just setup a second container and use a few spoonfuls of live culture as a starter. How long will my culture last?" How can I extend a culture's usable life? Once a culture is going well, stir it up thoroughly at least every other day. This aerates and prevents anaerobic bacteria of decay from building up in the lower reaches. When it looks like it is starting a downturn, you can further extend it by removing a half to a third of the medium and stirring in fresh, slightly drier oats. With care a culture can conceivably go for a couple months. What containers are suitable for culturing nematodes? You can use all sorts of containers. 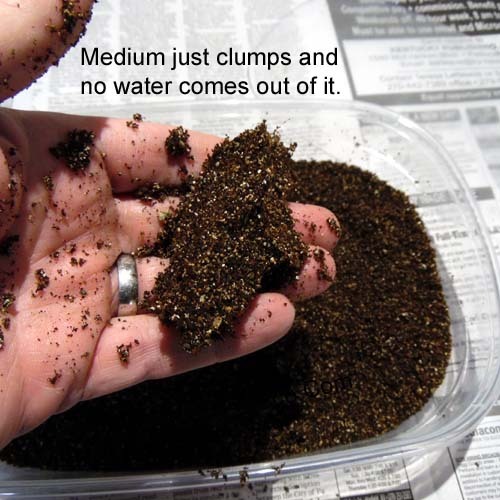 The worms mainly live on and near the surface of the medium, so the best containers are relatively shallow, with a lot more surface area than depth. I find plastic tupperware style containers from the $store work very well. They must have a cover that can be sealed and that you can cut an air vent into. In the tutorial above I use a sandwich size container, but in practice I keep 12 to 16 plastic shoe box cultures going. How do I harvest and feed nematodes to my fish? 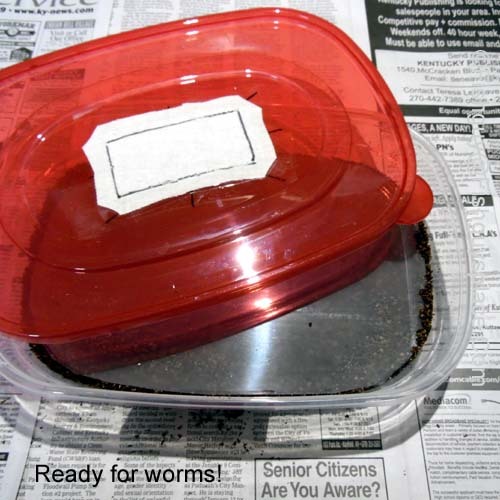 Once your culture develops a large enough population the worms begin crawling up the sides of the culture container. The less squeamish simply swipe a finger along the container wall and swish it in the fry tank being fed. Equally easy is keeping an old teaspoon next to the culture and swiping it along the wall to gather worms and transfer to the tank. I supply plastic pipettes with all my culture purchases, and you can collect worms as above, transfer them to a small container of water, and then use a pipette to feed fry from that container. What can go wrong, and how do I deal with it? Happily, nematodes are one of the easiest and least problematic live foods to culture. In warm weather, fruit flies seem to be able to get under most lids and lay eggs in the cultures. You can deal with the immediate problem in a given culture by first getting the winged flies out of the container (outside). When the maggots in the culture are ready to pupate, they will climb up on the sides and lid and turn into little, brown cocoons that are easily popped or removed. To avoid this altogether, either get containers with fly-proof lids, or simply keep your culture containers in pillowcases that are twisted and rubber-banded shut. Sometimes a culture develops a very thin, cloudy, white film on its surface. This is actually more serious than flies since it cuts off oxygen to the culture below and can smother it. I think it is an aerobic bacteria or form of yeast, since it appears to be alive and reproduces. It seems to happen less in mature cultures with very heavy worm populations, which may help keep it down. The only remedy starts with not spreading it to other cultures with hands or spoon, etc. Then, using a large spoon skim it off the affected culture, and very thoroughly stir it up to submerge the small bits you've missed. Sometimes this works, sometimes not, but I know of no other way to fight the scum! 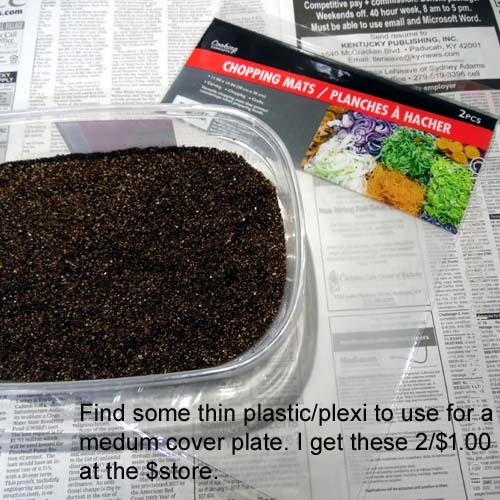 Here I am using a 12" x 8" size shallow, plastic, food storage container. These are readily available at most $stores. Surface area is more important than depth, and 1" is a good depth for these worms. 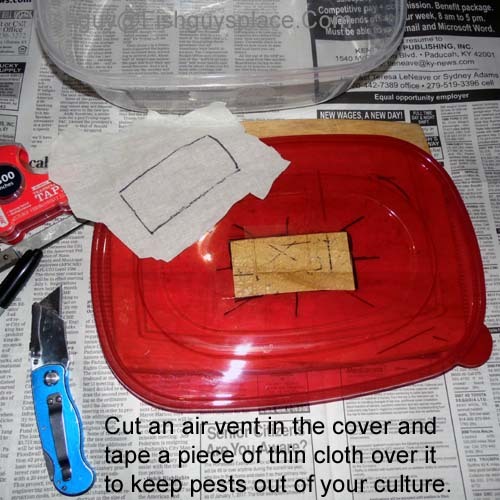 Cut a vent into the lid and cover it with a piece of thin muslin cloth taped in place around the edges. Air passes through this and pests are blocked. A yard of this is just a few bucks at Walmart or a fabric store and lasts forever. You can use any size container you wish. 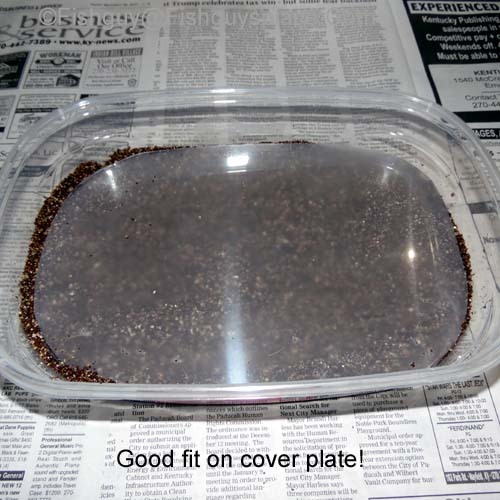 Some use a smaller container at first then expand to larger containers as the culture grows. 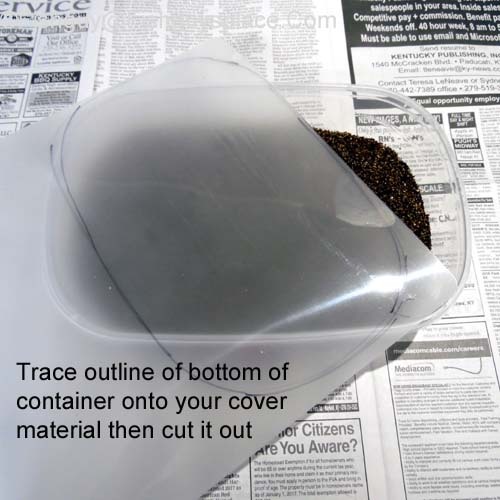 Use the same construction for any size container. Next add the medium. Here I am using a mixture of coconut fiber called coir and vermiculite. The coir is inexpensive and readily available on Amazon in compressed bricks. I hydrate mine in a 5 gallon bucket per directions on the brick, then cover it and store in the same bucket. Using boiling water to hydrate also sterilizes it. The vermiculite buffers moisture and moderates the compacting of the medium as the culture ages. 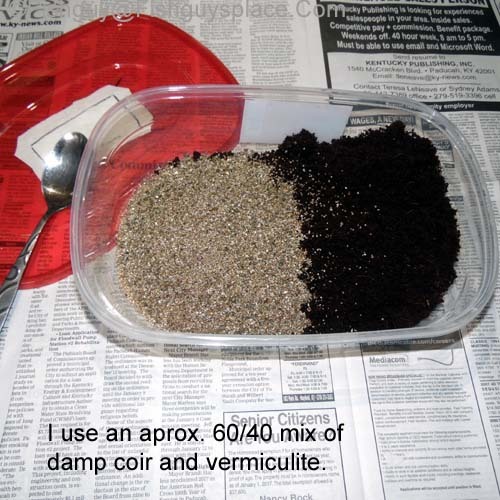 Proportions aren't critical, but 60/40 coir/vermiculite is a good mix. Mix the medium thoroughly with a clean spoon. You can also use potting soil that does not have any fertilizer or other additives. CAUTION if using potting soil you must sterilize it thoroughly to avoid introducing mites. Dampen it, then sterilize by either microwaving for several minutes until it is quite steaming hot, or by baking it in a conventional oven at about 300F for a half hour, again until it is steaming hot. Mix it intermittently during this process to make sure it is cooked through to kill any mites or eggs. You can also boil it then cool and dry it. A cover plate is needed for the medium. Any lightweight, preferably transparent plastic will do. In the past I've used clear mylar sheeting from the craft store, but recently I've come across these translucent plastic mats that are two for $1.00, at the $store of course! Ideally it will just about fully cover the medium in your culture container. Verify that it fits well, then set it aside while you finish preparing the medium for the introduction of worms. Judging the proper moisture level is a learned skill. 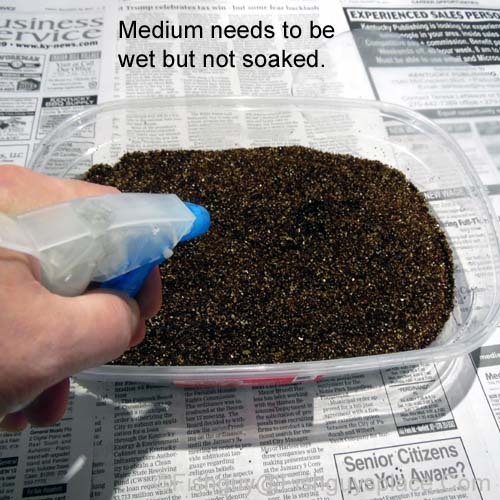 Moisture builds up as a culture ages, so it needs to be moist but not too wet to begin with. A spray bottle of water ($store again) is a good tool for adding water. Give it a few spritzes, then using the spoon work the water in evenly, breaking up clumps. When the medium just holds together when squeezed, and no water comes out you are at a good point. Remember it is much easier to add moisture than it is to remove it, so take your time. Container and medium are now ready! Time to add grindal worms and start your culture.